Many varieties of plants prefer to grow in rich, well-drained soils. However, many parts of the country lack adequate soil compositions necessary for healthy plant growth. 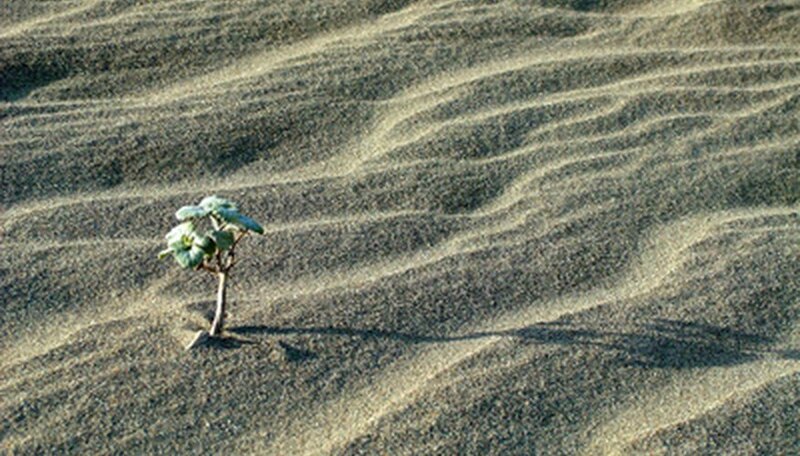 In addition to clay and silt, sandy soil poses a problem for many types of plants. Sandy soil intended for landscaping or gardening use requires soil additives to stabilize porosity and increase nutrient values. Improving sandy soil increases your chances of growing healthy vegetation. Perform a soil test to establish the pH level and amounts of existing nutrients. Sandy soil may require additives to adjust the pH balance and increase necessary nutrients, in addition to requiring adjustments to the porosity. Purchase a soil test from your university extension office and follow the enclosed instructions. Add any soil amendments or nutrients recommended by your soil test results. Remove existing vegetation from the area before incorporating organic matter. Clear the top few inches of soil, eliminating weeds, roots and debris. Spread a layer of clean compost over the surface of your sandy soil. Use a commercial source of sterile compost to avoid introducing mildew and bacteria into your soil. The amount of compost required depends on the amount of sand in your existing soil. Start by spreading a few inches of compost over the soil and working it in with a garden tiller. Go over the area until the sandy soil and compost mix together. Check the composition of your soil by adding a little water to a small area. Pick up the moistened soil in your hand a squeeze into a ball. If the soil crumbles apart and resists compaction, add a little more compost to the mix. Rake smooth before planting. Grow ground covers, such as clover and ryegrass in areas of sandy soil. These types of ground covers increase the level of nitrogen in poor soils, while providing erosion control to areas containing sandy soil. Till these ground covers into the soil in the spring to increase the level of organic material and stabilize the sand. Spread clean straw over garden areas and other planting sites containing large amounts of sand. The straw helps hold moisture near the roots of plants and slowly decays, increasing the amount of organic material in the soil. Likewise, incorporate grass clippings and raked leaves into the soil in sandy areas of your yard or garden.